Guymer Bailey was asked to update and extend this Sorrento holiday home to create a welcomed escape from busy city life and capture the 360-degree views of the ocean, Port Phillip Bay and the Mornington Peninsula toward Red Hill and Arthurs Seat. Desiring a space that would bring family and friends together to socialise, we worked alongside our clients to create large entertaining areas, multiple decks and an inviting pool area. A large entertaining area on the kitchen level opens up to the northern ‘summer’ terrace for indoor and outdoor living, where the more formal lounge level opens out to the north east ‘winter’ terrace complete with fire pit and intimate landscaped seating areas. These series of outdoor rooms provide the owners with greater flexibility in how they use their home. 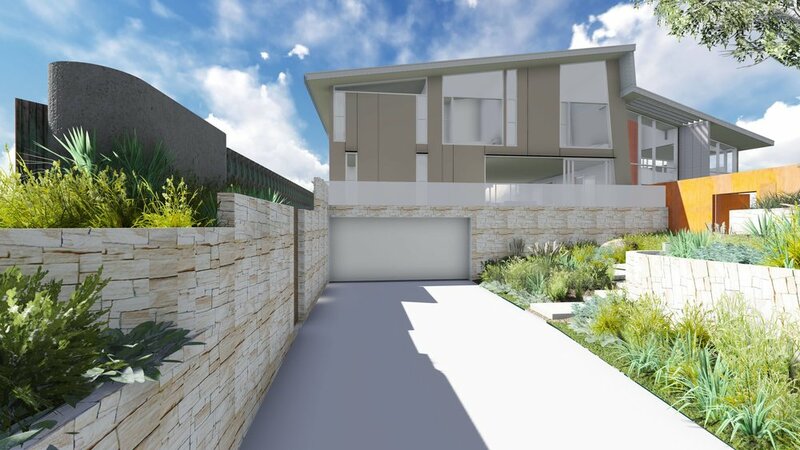 Both the architecture and the landscape design have evolved from a deep connection with the surrounding environment taking inspiration from the vast ocean views, rocky cliffs and long stretches of sandy beach. Water elements guide residents and visitors through the various outdoor spaces that are tied together by a refined palette of materials and locally endemic planting.